All-Area Football Coach of the Year John Campbll of Edinburg Vela. EDINBURG — Edinburg Vela hired John Campbell on April 19, and from that day on, the coach has been in a whirlwind. Just last week, Campbell finally got some meaningful time to relax after leading the SaberCats to the third round of the playoffs. Still, anyone who knows Campbell knows he never really relaxes completely, and it is his dedication and obsession with football — combined with his ability to teach, guide and lead his players — that netted Campbell The Monitor’s 2017 All-Area Football Coach of the Year honors. In the days and weeks that followed Campbell’s hiring, Campbell scrambled to build a staff to fill his blind spots and weaknesses. The other major concern was getting his team into spring football. The UIL allows teams to choose extra practice time during the spring or fall. Campbell knew he would be tweaking the offense and the defense, so spring ball was a must. 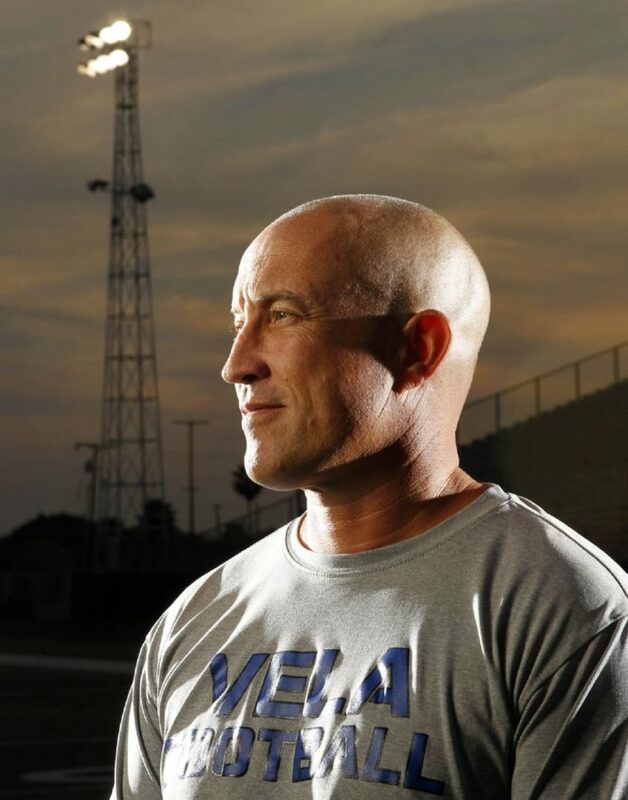 From the time he was hired, Campbell has always praised former Vela coach Michael Salinas for the condition the program was in when he took over. Campbell led the SaberCats to an undefeated regular season, that allowed them to go three rounds deep into the playoffs. The SaberCats’ season finally came to a close when Vela lost to Austin Westlake, 70-14, in a Class 6A regional quarterfinal game on Dec. 1. Since then, Campbell has finally had some free time, which allowed him to take care of a couple of important things. Before he was hired at Vela, Campbell spent much of his career coaching high school football in San Antonio. One exception was in 2015, when Campbell coached at Texas A&M-Commerce. So on Dec. 16, Campbell was in attendance to see Commerce beat West Florida to win the NCAA Division II national championship. “To be able to finish off our season, and then I had a chance to go and see the kiddos that I had coached and helped recruit over there at Texas A&M Commerce, watch them win a national championship. Then to come back and watch my daughter graduate. Then head back here to wrap up the school year, and to find out that I’m being recognized this way, it’s been a pretty good week,” Campbell said. Campbell’s daughter graduated from Texas A&M-San Antonio, and plans to join Campbell’s son in following in their father’s footsteps. For all of the accolades and awards, nothing speaks more directly to Campbell’s ability as a coach than what his players say about him. Garcia said he believes Campbell was the perfect fit for Vela. Garcia and Campbell became close over the past six months. Part of the reason for that connection is the job Campbell does trying to connect with his players.